One of Cozumel’s most popular dive sites, Paradise Reef is famous for its clear water, diverse coral structures, and teeming schools of colorful fish. 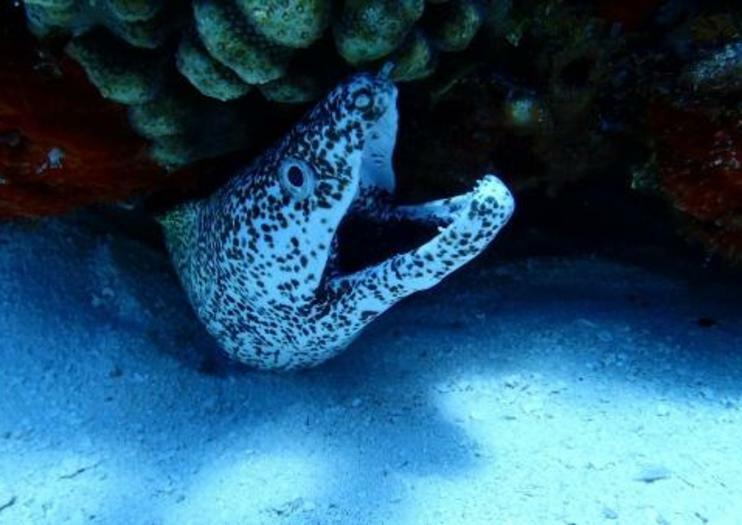 Here you can spot large sea species such as eels, rays, and nurse sharks in addition to smaller creatures such as seahorses, boxfish, and delicate pipefish. Paradise Reef is an ideal spot for snorkelers and novice scuba divers, as well as advanced divers who want to experience the reef’s colorful atmosphere. Most cozumel snorkeling and diving tours include a visit to Paradise Reef along with Palancar Reef and El Cielo Marine Park. Some Cozumel-based tours include hotel pickup and drop-off, while other excursions include round-trip transportation from Cancun and Riviera Maya-area hotels. Paradise Reef is a must-see attraction for nature and wildlife lovers. Remember to bring sun protection and water. It’s also a good idea to wear a wetsuit or rash guard to protect your skin from rough coral and jellyfish. Evidence of scuba diving certification is required for certified dives. Be careful not to touch or disturb the wildlife. Paradise Reef is located off the island of Cozumel near Mexico’s Yucatan Peninsula. It lies south of the Puerta Maya Cruise Ship Pier and is one of the first dive sites in the Cozumel Marine Park. Experienced swimmers can do the dive from shore, but most choose not to fight the current and instead dive from a boat. You can opt for a private charter boat or a guided tour. You can visit Paradise Reef year-round, but it’s busiest from December through April, when the weather tends to be sunny and warm. There are fewer crowds during hurricane season (May through October), but be sure to check the weather for storms. Cozumel is best known for its expansive coral reefs, some of the largest in the world. Paradise Reef and the Palancar Gardens are ideal spots for novice divers and snorkelers due to their shallow depth and offer a chance to glimpse sea turtles, colorful fish, towering coral spires, and gently waving sea fans. The Palancar Caves are probably the most famous dive site, with huge brain corals and swim-through tunnels. Palancar Horseshoe is another massive formation of corals. Explore Cozumel's reefs via catamaran on this half-day snorkeling tour. Dive in to get clear views of marine life at two snorkel stops where you'll swim with a guide, then refuel with beverages and snacks on board the boat. Use of snorkel equipment included. Navigate Cozumel crystal clear waters and adventure in the most amazing snorkeling tour and Catamaran fun ever! Your Captain and crew will sail away to the beautiful turquoise waters of the caribbean making a first stop at famous Paradise Reef to get your snorkel adventure started. Your experienced snorkel guide will point out the best spots for marine life such as spotted moray eels and smooth trunkfish and coral formations.If you decide to stay on board, relax on the deck, suntan, listen to music or refresh with some ice cold drinks from the Open bar and enjoy the delicious homemade snacks.After snorkeling we sail to the exclusive ” Westin Resort” on the north side of the island where you will enjoy its facilities before indulging in a delicious meal from the mexican buffet specially prepared for all tastes.After lunch we head back again to port, relax to the sweet sounds of the ocean, take a last drink from the bar and have a great closure to a day full of fun and adventure! Feel like a VIP on a private 3-hour catamaran cruise in Cozumel, famed for its pristine beaches and turquoise Caribbean Sea. As you sail along Cozumel’s coastline, you’ll feast on fresh guacamole, seasonal fruit, and cold beverages while receiving undivided attention from the crew. Stop to swim and snorkel among marine life and listen to music of your choice throughout the cruise. Choose from a morning or afternoon departure. Experience some of Cozumel's top diving sites on a day trip from Cancun. Certified scuba divers have the opportunity to explore the waters of two renowned diving locations, with weather-dependent visits to Palancar Gardens, Santa Rosa Wall and Tormentos—home to incredible sea life like nurse sharks, angelfish, lobster and barracuda. Explore the underwater wonders of the Caribbean in a must do while visiting Cozumel !! !Join us on board our comfortable and fast glass bottom boats to take you snorkeling to three magnificent reefs in Cozumel, full of sea life, colorful tropical fish and surrounded of the stunning turquoise crystal clear waters of the Caribbean.Our friendly and professional crew, will take care and guide you every step of the way, no matter if you are an expert snorkeler or trying for the first time !!! A full snorkel gear of mask, sanitized snorkel tube, mandatory life vest and fins will be provided to allow you enjoy your snorkeling with absolute comfort and safety.Not a swimmer ?? Not a problem !!! You still can explore the beauties of the underwater world through the glass bottom of our boats, so you don’t miss this incredible experience. Once the snorkeling part is over, refreshments such as ice cold purified water, sodas and beers will be served. Are you ready for a one of kind adventure? Sail away through the Caribbean waters of Cozumel and enjoy this amazing catamaran and snorkel experience. Admire the magnificents views of the caribbean sea and feel the the ocean breeze while your Cozumel catamaran makes it's way to beautiful and renowed paradise reef for some amazing snorkel fun!Enjoy the snacks aboard, Relax to the music, Refresh to the ice cold drinks form the Open bar and delight the delicious lunch meal we have specially prepared to pamper your palate. If you're not a snorkeler then just stay aboard, relax on the deck ans suntan while our captain navigates through the turquoise Cozumel waters in the smoothest ride ever! Sailing has never been this much fun! This is a fun catamaran sunset tour in Cozumel and a good way to spend your evening on a spacious catamaran enjoying some coral reef snorkeling, sailing the Cozumel Island coastline and watching the sunset. There is an open bar included onboard as well as delicious snacks of fresh and homemade Guacamole!As you sail through the brilliantly blue Caribbean water, you may stretch out and relax. The crew will pass out your provided snorkel gear and go over instructions as you reach the reef. They will provide you with all the assistance you might need to enjoy the beautiful reef and marine life below.Sponges, colorful tropical fish, magnificent coral formations can all be found in the crystal clear, warm water of Cozumel. After your snorkel, the captain will take the boat along the shoreline as you enjoy watching the sunset on the horizon.Music, drinks, and snacks included.There is a restroom on the catamaran along with space to store your personal items. Navigate Cozumel crystal waters in your own private charter in the most exclusive adventure! Relax your senses to the sound of the waves breaking against the wind while you captain sail away above the spectacular caribbean sea. Your deluxe 42 ft Catamaran charter is specially designed to accommodate comfortably 25 guests and a capacity to host up to 35 at your convenience. The crew will take care of the smallest detail while you relax on the deck, listen to music, decide to snorkel or refresh to the ice cold drinks from the Open bar and delicious homemade snacks specially prepared to pamper you and your guests This amazing charter experience is reserved for those looking for the exclusivity that only sailing can offer and is the most authentic way to explore Cozumel breathtaking waters.